Vaishali Nigam Sinha is the Founder Director of iCharity. She has more than fifteen years of experience in the banking and financial services industry worldwide. She started her career with JP Morgan in New York, and subsequently worked for Daiwa Securities in the area of equity capital markets in London. She then joined Prudential Financial in New York where she headed the company’s efforts to develop their mutual funds business in several Asian countries, including India. Vaishali returned to India almost 10 years ago where she first helped establish and head Daiwa’s investment banking business in India, and then worked in Macquarie Bank’s advisory practice. Vaishali has two Bachelor’s degrees from Delhi University – in Political Science and Education, and a Master’s degree in Public Policy from Columbia University, where she was awarded the prestigious International Fellowship by the American Association of University Women. Vaishali’s strong commitment towards social sector issues and a desire to make a real difference in the lives of the under privileged is the inspiration behind iCharity. Through iCharity, she hopes to bring professionalism in fundraising for the social sector and promote a positive giving culture among Indians, wherever they might be in terms of geographic location or position in life. And after a successful and varied career in the financial sector, Vaishali founded iCharity to pursue what she truly believed in. Vaishali is a strong advocate of equal participation of women in economic activities especially at the grass-roots. She is an active participant in prominent debates and public forums and speaks about various issues concerning women empowerment especially in the field entrepreneurship. 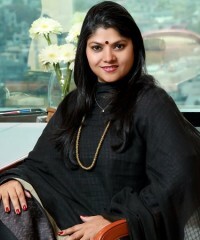 Vaishali also serves as Chief Sustainability, Social Responsibility and Communications Officer of ReNew Power Limited, one of the largest Independent Power Producing companies in India.